If you have an interest in the mysteries of biblical archaeology, a stop at Tel Gezer to visit the 3500-year-old Canaanite temple of standing stones is a fascinating and moving experience. The size and number of steles, makes viewing them as awesome as a trip to Stonehenge, but in fact, they are right in our own backyard; a mere thirty minutes from Tel Aviv or Jerusalem! From there it’s a short drive to Ramla for a stroll through a shuk with a hummus and falafel stuffed pita in hand. You can end the day viewing a bridge constructed in the Middle Ages which continues to be used daily as an entry to the city of Lod. The cultic site at Gezer dates to the Middle Bronze Age (2000-1500 B.C.E. ), when the well-fortified hill was one of the most important cities in Israel, controlling the junction of the Via Maris and the road to Jerusalem. Its strategic importance through the ages can be easily understood today by viewing from the tel the 180-degree expanse, which includes the Ayalon Valley, The Judean hills and the land to the west toward the sea. This view may be one of your most dramatic vistas of your Israel tour. There are some other important sites to visit at the tel, but if your time or interest is limited, you may wish to view only the steles by backtracking from the end of the trail. As you reach the center of the northern part of the tel, you are immediately struck by the splendor of ten monolithic stones standing in a row, soldier-like. Each stele is different from the other in size and shape; the tallest being 3 meters high. Some scholars believe that this temple served as a venue where alliances between tribes or city states may have been forged or renewed. 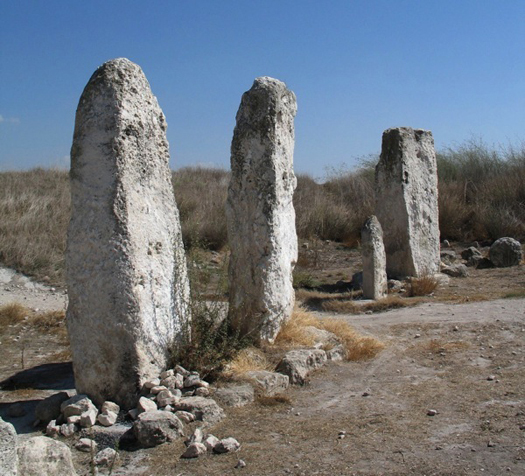 The ten monoliths may represent Gezer and 9 allied cities in its vicinity. The sacred precinct also contains a stone basin, which may have served as a container for blood libations poured during the alliance ceremony. Early in the morning, he set up an alter at the foot of the mountain, with 12 pillars for the 12 tribes of Israel…Moses took one part of the blood and put it into the basins, and the other part of the blood he dashed against the alter. References to the importance of Gezer during the Middle Bronze period can be found in the El-Amarna letters in which the kings of Gezer established their fealty to the pharaoh. However, the glory of the Canaanite city ended in a fiery battle, most likely during the military campaign of Pharaoh Thutmose 111, in 1468 BCE. The remains of the Canaanite tower and the well-preserved mud brick portions of the Canaanite gate, near the beginning of the trail, are impressive visible remains bearing witness to the early importance of Gezer. Also, to the left of the tower, you will note stairs leading to the ancient water system whose 7 meter deep shaft and 45 degree angled tunnel provided sustenance to the residents of Gezer living within the city walls. After a short walk down the trail you will encounter a beautifully preserved gate and water channel attributed to the 10th Century BCE. reign of King Solomon. Indeed, 1 Kings 9:16 recounts the destruction of Gezer by the pharaoh, who then gave the site to Solomon as part of his daughter’s dowry. Solomon proceeded to build a royal Israelite city, whose massive fortifications remain clearly visible today. Also dated to the Solomonic period is the well-known Gezer calendar, a small limestone tablet of agricultural chores, evidencing the earliest use of written Hebrew. Unfortunately, the calendar is not on display in Israel. As you conclude your visit to Tel Gezer, look west, past the space ship-like Nesher factory, where in the distance you should see the town of Ramla. Its historical connection to Gezer is vital, in that the Gezer springs, have through the ages, filled Ramla’s ancient underground reservoirs. Ramla was founded as an Arab city in 716 CE and served as the capital of “Jund Filastin”, a geographical area of the Syrian province of the Arab empire, until the Crusader conquest in the 11th century. Today thousands of Israeli-Arabs, and Jews, live in Ramla among an architectural mix of medieval mosques, Episcopalian, Franciscan and Greek Orthodox Churches, giving the town an interesting religious and ethnic texture. If you are a participant in holyland travel, your visit to Ramla may be especially meaningful. 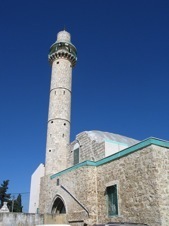 It’s a short drive from Gezer west on Route 424, which merges with Route 44, to Ramla for a visit to its shuk, Franciscan Church and the Medieval White Tower. 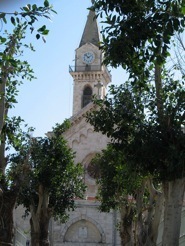 As you enter Ramla from Tel-Hai Street, park your car near the Hospice of St. Nicodemus Clock Tower which served as French staff headquarters during Napoleon’s battle for Palestine in 1799. You can enter this Franciscan Church from Bialik Street daily from 8 to 11 in the morning. However, you may want to call ahead (08-912 7200) to ensure your expeditious entry, as the complex also houses a private school. A highlight of the beautifully adorned chapel is an original painting by Titian depicting Jesus being removed from the cross. The chapel is oval in shape with magnificent crystal chandeliers and stained glass windows. Its 8 arches are clad in marble and stone. From Bialik St., return to Herzl St., and proceed left to Dani Mas St., across from the Episcopalian Church with its short/stubbed tower. It will then be about a four-block walk toward the tallest building in the distance, one of the oldest attractions in Israel. 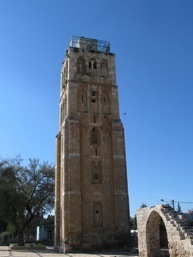 This 100 ft. high “White Tower” was built in 1318, during the Mameluk era, over the remains of an earlier tower. It’s a steep climb up the 119 steps, but upon reaching the top you will understand why the tower has served not only as a minaret, but has been of strategic military importance through the ages. Beneath the tower lies a huge water reservoir, while surrounding the exterior of the tower are the remains of the “White Mosque”, which was constructed in the 10th century and clad in white marble. Adjacent to the mosque is a Muslim cemetery with the white painted tomb of the legendary traveler and preacher Nebi-Tzalach. A short walk from the “White Tower”, near the intersection of Herzel and Haganah, is another large underground reservoir, the pool of St. Helena. There, in what looks like an underground Crusader castle, you can row a small boat under arched ceilings. The pool was constructed in 798 CE venerating Helena, the mother of Emperor Constantine, who some 400 years earlier had traveled to the Holy Land to oversee the construction of churches. Note the carving of this date near the entrance to the pool. By now perhaps you have built up an appetite. If time permits to sit down for a meal, you may wish to try the humus at the Khalil Restaurant, 6 Kehilat Detroyt, just two blocks to the right of Bialik Street. If continuing your walk with a pita in your hand suits you better, Zaki’s Falafel stand at 104 Herzl is said to be the best in town. Who can travel to Israel without eating a stuffed pita with salad and falafel! From there it’s a short walk down Herzl St. to the shuk where you can enjoy its vibrant atmosphere, the bright colors of its varied fruits and vegetables, and fragrant spices. In this immediate area you will also find an imposing minaret, which is part of a well-preserved mosque that was originally constructed in the 12th century as a rectangular Crusader church. The modest interior has a long carpeted aisle and a vaulted ceiling supported by 14 arches. The exterior plaza of the Mosque, which is surrounded by a high wall, has been recently renovated with white marble and stone. As you walk near the market you will note to the east a neglected area, a remnant of the heavy fighting in Ramla between Jewish and Arab forces in 1948. On Herzl St., to the right of the shuk, a memorial to members of the Israel Defense Forces can be found in a newly developed garden. Also, at the corner of Herzl and Shlomo Hamelech streets, you will find the Ramla Museum (08 929 2650), which is often overlooked during tours of Israel. In the museum’s three small rooms artifacts, photographs, and jewelry, relevant to Ramla’s major historical periods, are displayed. Most interesting is the hoard of gold coins, whose recent excavation is well documented in English. At the conclusion of your walking tour of Ramla, proceed by car east on Herzl St., over the railroad tracks. Turn right and then at the traffic light, make a U-Turn following the signs to Route 40, direction Lod. After several miles, and immediately before the Route 1 viaduct, turn left following the sign to Lod-Old City. Proceed to the circle, park your car at the gas station and carefully backtrack by foot to the stream near a grouping of evergreen trees. In front of you lies the oldest stone bridge in Israel still in use today. The bridge was constructed during the rule of the Mameluks in 1273 CE and has well withstood the test of time. Between the beautiful reliefs of the two stone lions an inscription attests to the building of the bridge under the direction of the Sultan Beibars. This concludes your Israel trip to Gezer and Ramla. 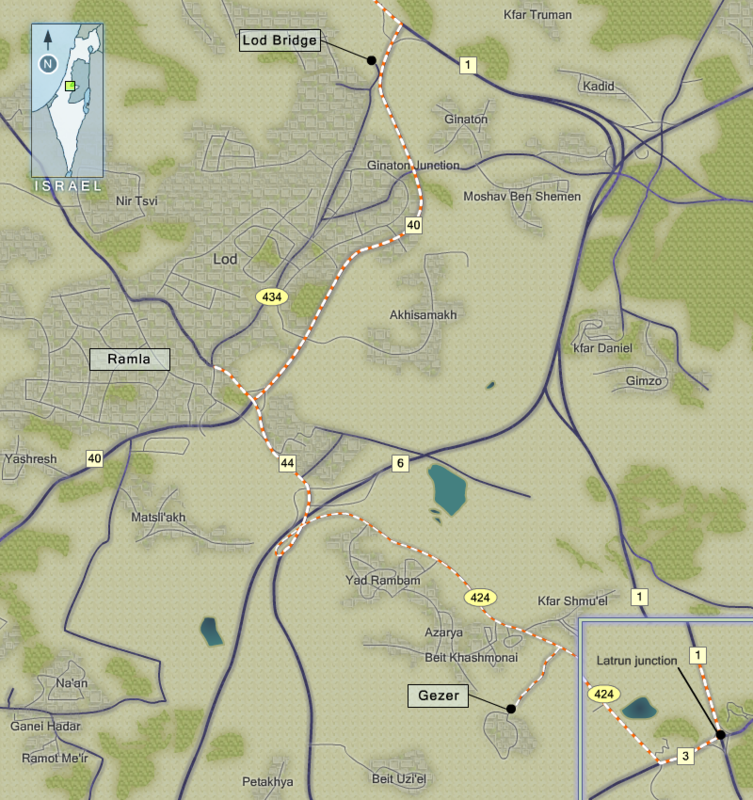 The nearby entrance to Route 1 can be used for your return to Tel-Aviv or Jerusalem. Please visit one of my other blogs for other ideas regarding places to see and things to do on your trip to Israel. 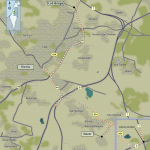 Directions to Gezer: coming from Jerusalem on Route 1, Exit at the Latrun junction and take Route Number 3 south less than a kilometer before turning right on Route 424. Proceed west for several kilometers before turning left to Gezer. From Tel-Aviv, exit Route 1 direction Lod/Ramla and proceed on Route 40 and then for a short distance on Route 44 to 424. Follow the sign to Gezer and immediately before the entrance into the moshav, turn right onto the dirt road which will lead you up to the tel. Note that as of March, 2011 the road has deteriorated dramatically since this post was first written. You may wish to use a 4×4 to reach the tel.